Dust on the ceiling is quite common, because we usually do not clear the ceiling during cleaning. As a result, the tiny dirt and dust particles are deposited on the surface of the ceiling, and it looks dull and gray. In premises with high humidity and in the kitchen steam and smoke also settle on the ceiling. Employees of our cleaning company will professionally and efficiently perform cleaning of your ceiling from dust and dirt. If you want to do it yourself, you may use pieces of advice given by our experts. Dry cleaning method is the best one to clean the dust from the ceiling. Purchase a long-handled brush with soft hair and use it merely for cleaning dust from the ceiling. This brush is convenient for removing cobwebs; it collects and retains fine dust and dirt without smearing it over the surface. It is extremely difficult to damage the ceiling surface while cleaning with such a brush. To remove dust from the ceiling, a vacuum cleaner with a soft brush-tip may be used. To avoid scratching the ceiling, the tip of the vacuum cleaner must be kept at a small distance from the ceiling surface. If the ceiling is particularly dirty, it is necessary to clean it manually. This requires a ladder or a sturdy table. The choice of cleaning method depends on the ceiling surface. Emulsion paint is the most common finishing coat of the ceiling in our homes. This coating does not tolerate wet cleaning; water contact with such water-based paint can cause stains and blotchiness. Therefore, the dry cleaning will suit better for such ceiling. Small contamination can be cleaned from the ceiling surface with special wipes. Before using them, check the effectiveness of their impact on the paint at an inconspicuous place. Taking care of ceilings covered with oil or latex paint is much easier. All-purpose detergent can be used to remove contaminants from such a ceiling. Dissolve it in water and wipe the ceiling with a sponge or a cloth soaked in this solution. In order not to leave any water stains or blotches on the ceiling, thoroughly wipe it with a clean dry cloth. Ceiling tile lined with polystyrene tiles with protective film on them can be cleaned with a damp sponge or cloth. If there is no protective film, only dry cleaning is recommended. 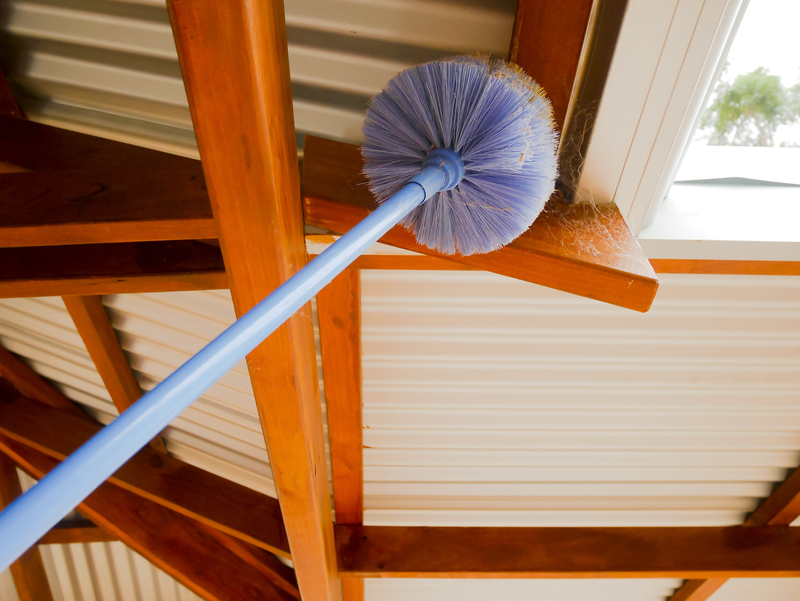 While cleaning the stretch ceilings you should be very careful not to damage the surface. They can be washed with lukewarm water with using some specialized detergent. To clean the surface use a spray bottle, a soft damp cloth or if you like it more – microfiber cloth. Excess moisture should be removed from the surface in the direction of the welding joint. The cleaned surface must be carefully wiped with a dry cloth. Important! When cleaning the stretch ceilings do not use hard brushes or abrasive detergents.